BANGLADESH – Kuakata - The boat that surfaced from beneath the sandy beach in Kuakata is of great antique value, said the head of the three-member investigation team, Research Assistant Md Golam Ferdous over phone from Kuakata Wednesday morning. The three-member team was dispatched by the Department of Archaeology, Khulna office following reports in The Daily Star. “We have examined the boat very closely and there is no doubt that it is an ancient boat, 200 or more years old,” said the researcher, “Our initial challenge lies in how to extract it out from the beach without inflicting any damage to the frame,” he added. Ferdous however said his concern at the moment also lies in guarding the boat from thieves until the excavation work begins. “Since that Tuesday we are here, we have not seen any initiative to guard it,” he said. The ancient boat belonging to the first Rakhaine settlers from the Arakan Province of Myanmar over 200 years ago, was found on June 29 during low tide in the Bay of Bengal. Sources in the Dhaka office of the department said that the Department of Archaeology does not possess any modern equipment, expertise or adequate fund to bring out the boat from underneath the sand and restore it to its original look. “We may seek help from outside sources with permission from our ministry and restore it,” said an official of the department in Dhaka willing not to be quoted. French born Bangladeshi, Yves Marre, who initiated a traditional boat museum under the banner “Protection and Preservation of National Naval Heritage of Bangladesh”, said he would be willing to assist the department of archaeology in extraction and restoration of the ancient boat. “We have to solve the fund problem and also work jointly with the administration to do this job," Marre said. “I can tell you, the prime minister of our country, Sheikh Hasina is very eager and serious in protection and preservation of our naval heritage and she will come forward to help us in this regard,” Marre added. INDE – Haluru - The University of Mysore’s museum of ancient history and archaeology will be home to recently excavated antiquities of the Satavahana period (1st century BC to 3rd century AD). The treasure was found during excavations at Haluru near Anuvahahalli in Tarikere taluk of Chikmagalur district. They were done under the directions of N.S. Rangaraju, professor of Ancient History and Archaeology at the university. Speaking to The Hindu, Prof. Rangaraju said around 800 antiquities were found during the four-month exercise, believed to be among the biggest taken up the varsity in recent years. 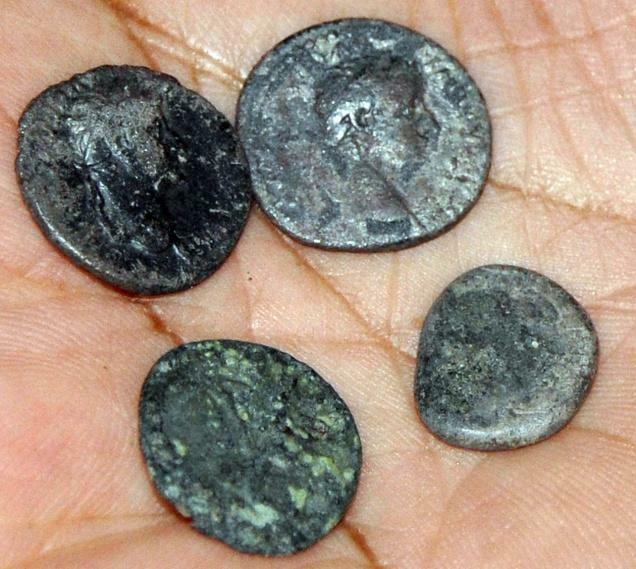 The finds included, to a numismatist’s delight, Roman coins and coins from the Satavahana period. Prof. Rangaraju said that among the discoveries were tools and microliths from 1500 BC to 1200 BC, 20 neolithic polished stone axes, stone pots, and iron antiquities, all of which indicated a continuous human settlement near the excavation site. The Satavahanas ruled the Deccan region and were followers of Buddhism. The cultural sequences unearthed during excavations indicated a continuous cultural settlement and offered an important insight into the history of Karnataka, he said. Interestingly, stone weights of different sizes and shapes, and small vessels of terracotta and stone, indicated that the region might have been a popular herbal medicine manufacturing centre. “The local vegetation and the rich biodiversity lends credence to this theory. 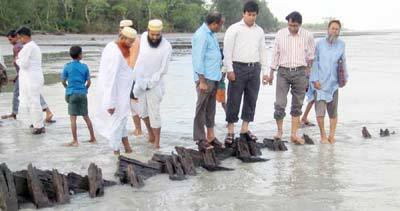 It is supported by a few botanists and retired Forest Department officials who visited the spot,” the professor said. Sudarshan, from the university’s Department of Botany identified 14 plants of importance in herbal medicine, he added. ARMENIE – Shengavit - In the 1930's it was discovered that the Shengavit site, on the southern outskirts of Yerevan along the Hrazdan River, contained a stone age settlement dating to about 4.000 BC on 10-12 hectares (25 - 30 acres) of land. A number of Armenian historians, archaeologists, and intellectuals worked to examine and preserve the site. The Soviets subsequently covered a significant portion of the site with a large hospital thus eliminating any further examination of the archaeological record on that tract of land. Yet Armenians persevered and were able to save much of the site. Archeological investigations have been conducted on and off since the initial investigations. After independence four segments of the preserve, amounting to nearly 40% of its area, were illegally sold to individuals and privatized. Director Tshagharyan spent a year and a half petitioning the Yerevan city hall, the public prosecutor's office, and the court system with reams of evidence, including archaeological reports and photographs of the site, proving that this area was to be preserved for historical and archaeological research. The oldest archaeological layer at Shengavit is from the Stone Age in the 4th millennium B.C. The area has been continuously inhabited since then. Later layers present a record of social and technological development from stone implements, to copper and bronze, after which the area was part of the Urartu (Ararat) Kingdom. The site presents a view of social development from tribal society to the development of a large organized community. The cultural developments at Shengavit were contemporary with similar developments as far away as Mesopotamia, Malatia in Western Armenia, and southern Russia. Shengavit's population traded with these areas and was at the geometric center of these cultural developments. The population was probably making wine and stored tons of grain. Estimates of the maximum population inhabiting the Shengavit settlement range from 2000 to 6000. AZERBAIDJAN – Agsu - Archaeological research conducted in Azerbaijan up to now shows that the country is one of the places of residence of an ancient man, director of the Azerbaijani Institute of Archaeology and Ethnography under the National Academy of Sciences Maisa Rahimova said a joint briefing with the Azerbaijani History Museum today. The briefing was devoted to the ancient treasure found in Agsu region. 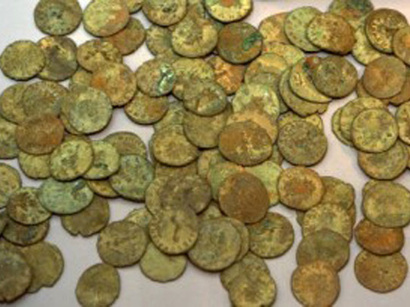 "Around 37 gold coins (Dutch ducats), scattered at a distance from each other, were found while conducting the seventh archaeological excavation operation on June 22, head of the Agsu archaeological expedition," Gafar Jabiyev said. Around 31 coins were minted in 1800, one - in 1781, 1786, 1796 and three in 1787. Their condition is good. "Similar coins were widely distributed throughout the world in 18th century," he said. "According to the specialists, the importance of ducats in the world during that period could be compared to the value of the U.S dollar today." A gold necklace was also found in Agsu on July 9, he said. He added that archaeological findings testify to the fact that Azerbaijani towns had close relations with many world cities in the 18th century. BULGARIE – Plovdiv - An ancient Christian burial site with preserved murals has been uncovered during excavation work for the electricity network of the Bulgarian city of Plovdiv. The archaeological find, provisionally dated 4th c. AD, is part of the southern necropolis of ancient Philippopolis and measures 1 by 2 metres. Its two large walls are covered with a depiction of the Resurrection of Lazarus, painted in five colours. The two short walls are covered with a number of Christian symbols, but theLazarus murals are believed to be unique for Bulgaria, said archaeologist Maya Martinova. The burial site has actually been uncovered in early May, but the process of study has lasted till now due to the complicated urban infrastructure it is entangled in. The cemetery popped up during excavations by electricity utility EVN, and is also located close to modern-day natural gas and sewerage pipes in the center of Bulgaria's second-largest city. For now, provisional plans would see the murals removed and exhibited in one ofPlovdiv's museums. AZERBAIDJAN – Kravelabi - The Institute of Archaeology and Ethnography under the Azerbaijani National Academy of Sciences together with the National Scientific Research Centre and Paris's National Saint-Germain Museum have started archaeological research in Lerik region of Azerbaijan (325 km from Baku) within the Morgan Heritage Research. At present, the group is involved in an archaeological dig in the necropolis burials in stone boxes relating to the early first millennium BC, located in the village of Kravelabi in the Lerik region, the expedition member Anar Agalarzade told Trend today. "The burials in stone boxes are important historical monuments which can give information about the rich history of the Azerbaijani southern region," he said. "While examining these monuments we expect to find archaeological materials reflecting the material and spiritual culture of the era, burial customs and religious beliefs." The discovered archaeological materials will be demonstrated at the Archaeological Fund of the Institute of Archaeology and Ethnography and in the scientific exposition of the Institute's museum. According to the research an international exhibition will be organised and samples of Azerbaijani material culture will be demonstrated. 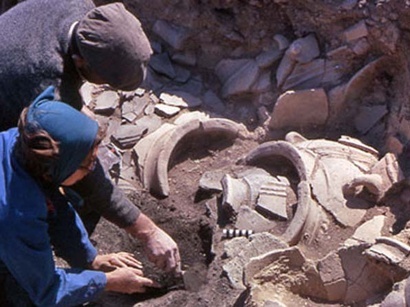 Agalarzade said that French archaeologist Jacques de Morgan in the late 19th century conducted archaeological excavations in the south-eastern region of Azerbaijan and took his findings to Paris. The samples of culture in Paris will be involved in research within this cooperation. SOUDAN – Kajbar, Shereiq and Upper Atbara - The Sudanese ministry for antiquities is appealing to the international archaeological community to conduct rescue operations to salvage Sudan’s rich archaeological heritage, which is at risk from a series of dams planned in areas including Kajbar, Shereiq and Upper Atbara. The proposed dams will flood various regions along the Nile within three to six years. 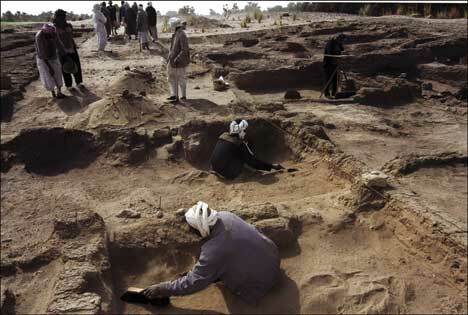 The vast number of archaeological sites within Sudan is a testament to the country’s long and rich history. A survey of the Upper Atbara area by El-Hassan Ahmed Mohammed from the NCAM has recorded at least 40 sites, including prehistoric settlements and cemeteries, 30 of which are in the flood zone. The University of Leicester’s David Edwards, who has worked in northern Sudan’s Third Cataract region for more than 20 years and who has, with Ali Osman Mohammed Salih from the University of Khartoum, recently published a survey of the area, said that there “is certainly no lack of archaeology” in the Kajbar region, noting that there are hundreds of ancient, medieval and post-medieval sites. Of the three “at-risk” regions, Kajbar appears to be the most widely explored by archaeologists. Edwards suggested several areas as a priority for future work in the region, including Arduan Island, which has an extraordinary concentration of pre-Kerma pottery.